Recently I find myself enchanted by an unusual number of the recipes I see in my blog reader. This salad. This pasta. This pizza. I want to make half the recipes I see every day. At first I wondered if I was just feeling hungry, but then I realized: corn is in season. As you know, summer and soup are not confined to separate seasons here in Seattle. So when I received Christy Morgan’s vegan Blissful Bites cookbook in the mail today, I was scanning for a soup to serve with quinoa cakes tonight. You won’t be surprised to hear that it was a corn chowder that caught my eye. Several things about this soup were surprising, though, at least to me. First, despite the longish ingredient list, it was a snap to make. It has both a good dose of curry powder and a generous scoop of miso; I would never have thought to combine the two, but the results were outstanding. Red lentils give the soup body, but the flavors are light; if ever there were a summer lentil soup, this is it. And of course the corn doesn’t hurt a bit. Corn and miso are a match made in umami heaven. 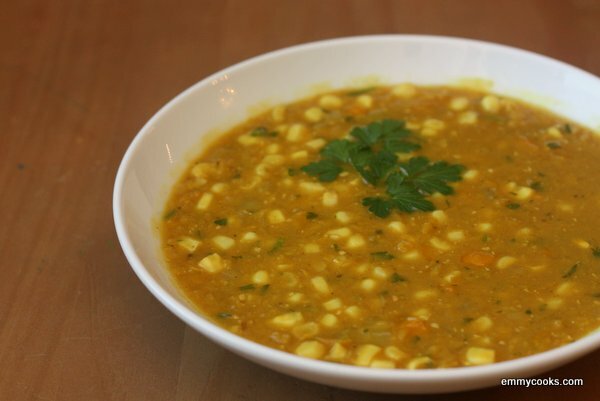 Red Lentil Corn Chowder (adapted from Blissful Bites): Heat a spoonful of coconut oil in your soup pot. (Side note: today was the first time I’ve noticed my coconut oil being liquid at room temperature: it’s finally summer in Seattle!) Dice and saute the following with a pinch of salt: half an onion, a stalk of celery, a red or yellow pepper. When the vegetables have softened a bit, add 1 Tb. cumin, 1 Tb. sweet curry, and 1 tsp. oregano. Stir for a moment or two until they are toasty and aromatic, then add 1 c. sorted and rinsed red lentils and 6 c. water and bring to a boil. If you are using fresh corn, add about 2 c. of kernels now (if you are using frozen corn, wait until the lentils are cooked). Lower the heat and simmer until lentils are completely soft, about 20 minutes (if you are using frozen corn, add it now). Remove from heat, then add 3 Tb. miso dissolved in a little water, 1 Tb. red wine vinegar, and a handful of chopped parsley. Add additional salt to taste (I added another 1/2 tsp.). p.s. I hear you loud and clear: you have nothing to say about Pinterest. That’s cool. I’ll just be puttering around over there (at pinterest.com/emmycooks, to be precise), looking at pretty pictures of things to cook. This entry was posted in Beans and Other Legumes, Easily Multiplies to Feed a Crowd, Food, Recipes, Soups, Vegan or Would-Be-Just-As-Good-Vegan and tagged blissful bites, corn, corn chowder, Seattle summers, soup, summer recipes, vegan recipes on August 14, 2012 by emmycooks. Love, love, love this recipe! Can’t wait to give it a go. I think it’s so great that you found Christy Morgan! I met her when we were attending the same macrobiotic culinary school in Austin, TX. She is super fun and a great teacher. The combination of curry and miso sounds amazing. I’m going to make it today just so I can taste it. Thank you! What an innovative corn chowder recipe. Can’t wait to cook up a big pot! P.S. Watch out, pinterest is addictive!! Love red lentils, especially in soup. Yum! Actually I find myself using less and less cookbooks in the kitchen and more and more blog friend recipes, which is great since everything always turns out amazing! This soup sounds great! Like you, I just started on Pinterest. I’ll be checking out your site once I’m back home – in cottage country right now where Internet access is sketchy! Love the simplicity of this recipe! Thanks for sharing! What is the amount of corn? Did I miss it? You didn’t miss it, I did! Updating now. The original recipe calls for 2 c. of fresh or frozen corn kernels, but I just use as many ears of corn as I have handy (don’t forget to save those corn cobs for homemade stock!). Thank you for asking–it was also fun for me to revisit this post and remember this day with my daughter. :) Take care and happy cooking.